We got take-out from the very recently opened China Gourmet this weekend and I have to say, they are off to a great start. We tried the Gourmet Fried Rice, which had shrimp, beef and chicken (I can't stop craving it), the Broccoli Beef and the Kung Pao Chicken, which was quite spicy when ordered at medium heat. We were impressed with each dish! China Gourmet's food was lighter than the typical Chinese fare we find in Salem and was very fresh. I'm guessing their menu is more authentic. I'm looking forward to trying their Crispy Gourmet Noodle and their Hot & Sour Soup next time. one word...DELICIOUS! they are not your typical chinese restaurant. The eggplant in garlic sauce is to die for. Ate there last evening. Gourmet Fried Rice very good - best I have had in Salem. Most fried rice I have eaten in the Salem area is mediocre to bad. Will definitely return to try other dishes. Terrific first visit last night. Cute place (the old Willamette Noodle/Burger Company and earlier Rockin' Rogers) with delightful owners and wonderful food. Finally found a local place that will make food as spicy as we like, and they provided housemade hot sauce for additional heat should we be so inclined. Even more exciting were their FABULOUS noodle dishes. Have not encountered others like them since Singapore. 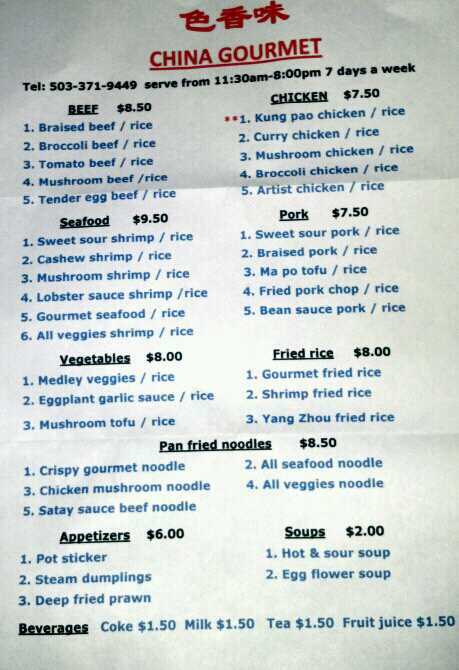 Our table ordered: hot and sour soup; gourmet seafood; garlic sauce chicken; eggplant in garlic sauce and satay-sauce beef noodles. Yum-my.